It’s 4:25AM on Friday morning. My alarm is set for 4:30 which should give me a half an hour to throw on clothes, pack the last of my food, eat a bowl of cereal and intercept the taxi driver before he rings the doorbell. A fine plan but Benjamin woke at three for a feed and I’ve lain awake since. Another five minutes in bed is an attractive proposition but the rest of the household have just found sleep so it seems wrong to wait for the alarm. Reluctantly, I swing my feet to the floor and deactivate the alarm. 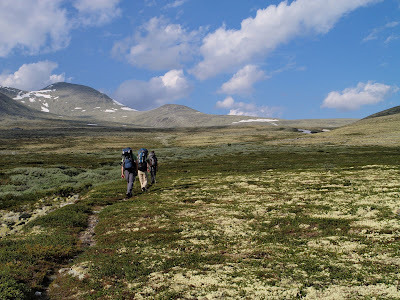 Today I travel to Rondane for my first major backpacking trip in ten months. Although the decision to go was made just a few weeks earlier it seems like an age has passed. Preparation and planning has filled my spare time for weeks. As the realisation that the trip is about to start gradually burns its way through the early morning fug, the fatigue peels away. Today, it seems that four hours sleep is enough. The excitement of what’s ahead powers me through the morning ritual. Dressed I roll down stairs and am just stuffing the bag of frozen food into my rucksack when, out of the corner of my eye, I catch sight of a well set grey haired man approaching the house. It’s the taxi driver. Unusually he’s ten minutes early. I wave. He gets the message and walks back to the car without ringing the doorbell. I shoulder my pack and walk out of the house. Unless there’s enough time at Schiphol I’ll be going without breakfast today. As I climb into the car Jeffrey bids me good morning. So far so good. At least two of the group will be on time for the flight. Twenty minutes later, the taxi fare paid, we walk through the revolving door into the departure hall. To our surprise Willem-Maarten is waiting by the check-in desk. He had said that he’d be taking the train but that, the NS schedule being what it is, he would be cutting it fine. Apparently Thim had SMS’d in the early hours, while en-route home from a concert, to say that the trains were delayed. Liesbeth had brought Willem-Maarten by car. After a few minutes, Thim sauntered up through the departure hall. He’d been catching up on his sleep in arrivals downstairs. Clearly I wasn’t the only one who didn’t get a good nights sleep. Theo arrived and we were complete. Ample time to check in and grab a coffee and a bight to eat on the way to the gate. The journey ran seamlessly. The flight to Oslo, the bus to Otta and then the minibus up the steep valley side to Mysuseter all connected conveniently and ran, more or less, on time. Only the Mysuster bus was slightly delayed. In the way of these relaxed small community services ten minutes here or there didn’t seem to concern the driver. The run up from Oslo had been long. The bus is not my preferred mode of transport and five hours of bus is , for me, about four and a half hours too much. As long bus journeys go, however, this was bearable. I had a double seat to myself and there was a WC. The scenery helped. The most annoying thing was the break. For a moment, about twenty minutes outside of Otta, it looked like we were ahead of schedule but a half hour stop for refreshments soon put paid to any idea of hitting the trail earlier than planned. Stepping out of the bus was a shock. We’d come a long way north but the temperature in the valley bottom was 28 degrees. The sun was burning hot. Last minute decisions to pack a peaked cap and a light shirt with a collar seemed to be good ones. Because we’d flown we had been unable to bring fuel. We’d opted for a gas burner for this trip. Largely due to the infallible availability of gas canisters. We took the opportunity during the pause to look for gas in a nearby service station. They had canisters alright, but only large ones. Prefering to carry two small cartridges, thus spreading the weight over two rucksacks, we trusted that we would be able to pick up fuel at the Mysuseter store. After all, in e-mail correspondence the store owners had clearly stated that they stocked “a diverse supply of canisters”. As we drive into Mysuseter the sun is still shining brightly. It’s 3:30PM and I’ve been on the move for eleven hours. Mysuseter, a small ski centre and gateway to the national park, is one of those small northern communities that looks out of place in summer. The paraphernalia of winter, snow scooters, snow ploughs a ski tow and the like, look out of place in the green. Mysuseter, I think, would look much better under a layer of snow. The bus skids to a halt on the gravel road in front of the store. We’re here at last! We jump down from the bus, retrieve our rucksacks, pay the driver and walk, in unison, the few steps to the store. Willem-Maarten and I go inside to buy gas. It soon becomes clear that we have a problem. The mail had said “we stock a diverse supply of canisters”. What it should have said was “we posses an eclectic collection of antique gas canisters only one of which has a screw connector”. We freeze for a moment while we take in the situation and compute the consequences. I estimate, under ideal conditions, that we need two 355g cartridges for the trip. Before me I see a single, Italian-made, rusted, 355g Butane/Propane canister that looks like it may have already done four laps of Rondane since it’s first sale in around 1965. We have a problem. We have predominantly dried food. It can’t be eaten cold. We’re heading into high alpine territory where no wood can be found. Unless we radically change the route and camp below the tree line (which basically means outside of the national park boundary) cooking on an open fire is out of the question. After a short discussion with the storekeeper, who offers to have a supply of canisters sent up from Otta with the next bus, sixteen hours from now, we’re left to scrabble around on the shelves looking for an alternative. The only viable one available to us is to purchase a Trangia burner and stand and a liter of meths to supplement the gas canister. We guess that if we use the meths to boil water for brews that the gas will stretch to preparing all of the planned main meals. It’s an unfortunate situation. The purchase, which includes a soviet engineered heavy gauge steel support for the brass meths burner, together with fuel brings, at a guess, an extra 1.5kg to the party. Furthermore, there is no windshield. I have two ultralight meths stoves sitting in my garage at home which, at a tenth of the weight, would have been far better suited to the job in hand. Still, beggars can’t be choosers and this way we get to stick to the planned route without diversions to purchase fuel or collect wood. In the meantime It’s started raining heavily. Big globs of cool summer rain fall through otherwise clear skies. I change out of my coolmax shirt into a merino baselayer as planned and throw a wind shirt over the top in an attempt to keep things reasonably dry. Thirty seconds later I find myself changing back into the shirt. Getting wet without overheating seems to be a better policy than sweltering in a merino top. The rain slackens off and after quickly consulting the map we head out of the village along a dusty gravel road looking for the DNT route to the Peer Gynt Hut. The original plan would have taken us along the road to Rondvassbu but we’ve made a last minute decision to do the route in reverse. The weather forecast is good for the first two days but is then set to turn wet. The original route would have put us on the hard, technical Veslesmeden to Storsmeden traverse in the wet. Most likely in low cloud and poor visibility. This way, although it means the first full day after the walk in will be a demanding one, at least we’ll have fine weather for it. I find myself walking at a good pace along the easy surface through a jumbled collection of houses and cabins. On most trips this is a period of uncertainty. What am I letting myself in for? Have I packed everything? Have I got the right kit with me? What’s in store? 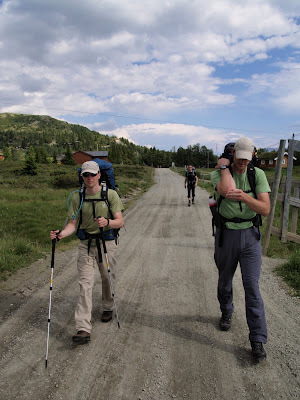 Normally it takes time to adjust to the feel of unfamiliar footwear and the weight of a big pack. However, this time I fall easily into a rhythm. Perhaps I’m right to be confident in my preparation and kit? Perhaps the clear summer skies and warm air are lulling me into a false sense of security? Whatever it is, Rondane is certainly welcoming us in with open arms and a warm smile. Whatever the reality we make good time and soon pick up signs for the Peer Gynt Hut. No need to navigate for a while at least. A little further we are given our first glimpse of the high tops of the central massif and a little further still we cross a bridge over a lively mountain stream and leave the road behind us. It seems that in no time we’ve left civilization behind us. The steady stream of holiday homes petering out, we find ourselves on a well trodden path undulating alternately over knolls decorated with birch scrub and then through shallow marshy valleys. A signed path leading up to the 1000m top of Kasen provides a momentary temptation. Discretion being the better part of valour, we pass by without making an extra unplanned ascent. The coming days will provide enough excitement and demand enough effort. With every short climb we emerge a little higher until after just a few kilometers we break through the tree line. What lies ahead is then a spectacular open subalpine landscape. The lower slopes decorated with stunted bushes. The higher slopes yellow and green with lichen and moss. Beyond lies the array of rounded high peaks from which the park takes its name. 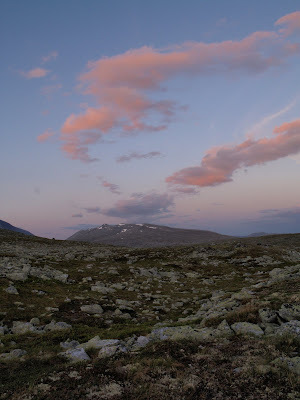 This is the Rondane landscape I’ve seen in a thousand photographs. The foreground and the backdrop are unmistakable. The colours are, however, more subdued than I remember. The stereotype landscape photograph of Rondane is taken in the autumn when the birch and berry foliage burn with the deep red flame of the year end. 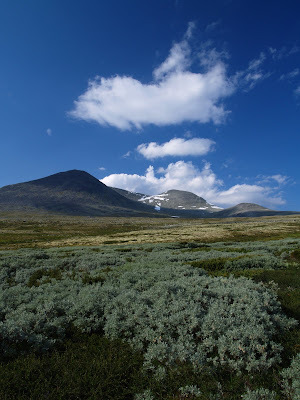 It will be a few weeks before the short northern summer yields to autumn and Rondane puts on its party dress but that’s not a problem. We are being treated to a more subtle but nevertheless breathtaking show. A dose of clear, early evening light is painting a different picture under sparkling blue skies and fluffy white clouds. The vegetation is almost luminescent in this shallow light, providing a seemingly artificial palette of greens and yellows to compliment the sky. My camera stays out of its bag and is seldom lowered from my eye. This is turning out to be a fine walk-in. As the path levels off and veers towards the hut we strike off north east up the Ljosae beck. With the north western slopes of Randen on our right hand we climb the gentle slope. First across a deep carpet of bilberry scrub and dry moss. Later over boulder fields and patches of old snow. From here the hooked ridge of Smiukampen and the top of Ljosabelgen , familiar to me from evenings spent pouring over the map, overlook our progress. As we cross the snow I wonder what we’ll find higher up the hill. The thought is only fleeting though. Today we won’t climb much higher. The intention being to find a suitable bivouac at around the 1400m contour. We’ll worry about the high ground and the ascent tomorrow. As we climb the vegetation thins and rock takes its place. Gone is the thick mossy bed we’ve strode across for most of the evening. It becomes clear that comfortable campsites are few and far between. The higher we go the fewer there will be. We decide to take a break and prepare this evenings meal before moving on to find a bed. We cross a fast flowing stream and put down our bags. The mood is relaxed and we soak in the long views of distant ranges to the west as a pan of soup heats on the stove. It’s still light and the sun shines but a chill wind picks up and suddenly it feels ten degrees colder. I’ve been walking in a short sleeved shirt but now I find myself donning a fleece and shell. A reminder of where we are. Hot soup fortified with pasta and sausage is a welcome, warming meal. A second course of rice pudding sets us up for the night. Fed and watered we wash the pots, pack up and move on. Meandering along just above the 1200m contour we find a series of reentrants offering some shelter from the wind and a softer lie. Under different circumstances it seems these spots might be wet. Tonight they are dry and are highly likely to stay so. We spread out and each man seeks out a suitable space. Bivvy bags, sleeping bags and mats appear from each rucksack. Before long my bed is made. I’m not fully out of the wind but as compensation I have a room with and endless view. What’s more, I hope that the wind will keep the bugs at bay. In any case it’s not cold. It seems highly unlikely that the frost promised by the Norwegian weather service will show up. After taking a last stroll to the east, just far enough to sneek a view of the Rondvasshogde and take a last photograph, I return to my bivvy, and wriggle inside. It’s now gone 11:00pm and its still light. I lie looking at the view, feeling privelaged and smug. Privelaged to be here in Norway, smug because I'm here under such conditions that I can lie out without a shelter. Thats the best sort of camp there is! I hand onto that thought until sleep finds me. 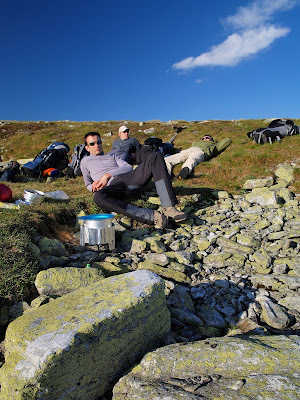 Beautifully written mate, you've just managed to add Rondane to my "Place's to visit, wishlist." Looking forward to the rest. Great stuff! Thanks for the words of encouragement guys. Glad you're enjoying the story so far. It gets better! However, you may have to wait for a couple of days. Busy working week ahead! A great story so far Dave, well done. Sorry to hear about your fuel problem. I have never visited the Mysuseter store but have always had excellent service at Holmans sports in Otta. Great writing Dave, inspiring. Photos aren't bad, either ;) The fuel problem is both funny and bad - you switched to gas after all for this trip, and now got to use a super heavy meths stove while the UL ones were at home. Ah well, the next time you will take one as a back-up! Hendrik,Glad you're enjoying it. Yes teh irony of the fuel situation has not gone unnoticed here. Roger, Exactly so. We were heading back to Gardamoen. Incredible. That was my grey Golite and I was stood just infront of it ;-). I'm afraid I didn't spot you. On the way up we took the bus. The train connection was poor. I think we had just 10 minutes for the connection to Mysuseter. Given that the bus left 10 minutes late we could have picked up a canister but hindsight is a wonderful thing. Mac: No worries there. Looks like it might be a while coming. Roger: I've been sieving through the debris of my memory of the morning of July 7 and I think I may havespotted you after all. I saw, to the left of the station building as you face it, somebody wearing a wide brimed hat and I suspect he was fiddling with gear and a rucksack. I guess I walked within ten meters or so of said person. Does that fit your description?